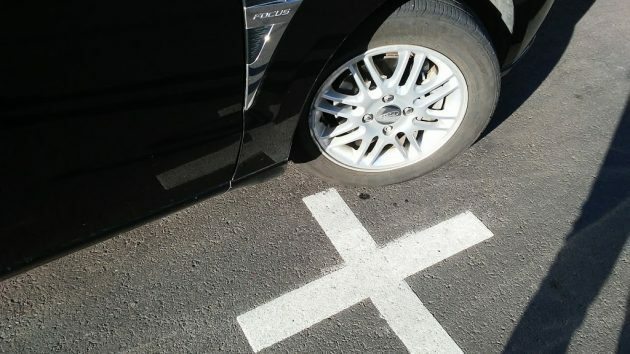 » Parking outside the lines: What’s too far? Parking outside the lines: What’s too far? It took me a while on Saturday to find, on Second Avenue, this illustration for the story below. If you park your car on downtown Albany streets on weekdays, it goes without saying that it’s best to park inside the pavement markings and not risk a ticket by straying outside. But what about being just a little outside? And how little is too much? Under authority of the city council, downtown parking regulations are enforced by the Albany Downtown Association with its ParkWise Program. The association’s executive director, Lise Grato, referred me to the municipal code. In places were pavement markings have been put down, the code says no person shall park a vehicle “other than … within a single marked space, unless the size or shape of the vehicle makes compliance impossible.” For downtown streets with time limitations on parking, the code says the same thing but allows no exception for over-size rigs. In short, if you feel wrongly ticketed, contact the association and hope that “reconciliation” will take place. If it doesn’t — to answer my emailer’s last question — downtown parking tickets are $35, according to the city code. If they’re not paid within 10 days, the price goes up to $40. And if unpaid after 30 days following the citation, it’s $70. The money pays for the ParkWise program, which Lise Grato told me has an annual revenue budget of $75,000. The program pays for payroll expenses — 100 percent of the single ParkWise officer, 50 percent of the association’s office manager and one-third of the executive director. It also covers the monthly fee for a parking enforcement software program called “Clancy,” plus a cell phone with a ticketing app, envelopes and other supplies. As a progressive in transition, I declare there is a better way. Arbitrary parking fines harm low-income people, disproportionately affect people of color, and anger those who love downtown Albany the most – CARA supporters. Grato needs to demand that the City Council create identity and income standards in the code that clearly state who should pay and not pay. People who are not privileged, suffer from pay inequality, or love CARA should have the fine dismissed. No need for an Orwellian “Board of Parking Reconciliation.” Social justice provides the solution. This would be the progressive solution. Oh pul-leeze! The simple solution is to to take 5 seconds and check to see that you are parking WITHIN the lines. If you aren’t, move your vehicle. And quit blaming others for YOUR choices. Agree – but everytime I wonder if a subtle marker on the sidewalk could help those of us without car cameras to avoid parking, getting out, checking, getting back in, restarting, and moving a foot and a half. Sidewalk markers would work if you’re parking on the left side of the street, but not the right. A lot of times I can just look in my mirror or stick my head out the window to see if I’m between the lines, but yesterday, I was in Lebanon and the markings weren’t quite wide enough so I had to get out to check…took me less than a minutes to do that and correct my parking. Is there anybody that can exit their car, check the parking accuracy, ratify or decide to re-enter their vehicle, and make any corrections, put their seat restraint on (it’s the Law) and relocate the position??????? Yes, everybody can do…it’s very easy to do. And if you can’t do it, then you shouldn’t be driving in the first place. How does it affect people of color more than anyone else? Gordon is yanking your chain as he tries to learn the lingo of the ruling party in Oregon. Time to get my sarcasm meter checked. There is no difference between abusive speech and violence. Scientific findings prove it. So please halt speech towards me that I consider a danger to my well being. Hasso should not allow provocateurs on this blog whose speech represent a threat to civilized society. DMV did away with the parallel parking test many, many years ago. That was the first part you tried in your driving test. Fail that & out you go. Sooo, now there are quite a number of drivers who have no clue on how to parallel park. Thus they get over the line fore or aft when attempting. Skip downtown & go to the box stores! How about parking tickets for the 10 minute spot where the ATM used to be at the former Wells Fargo building. Downtown Association told me that it is up to the City to remove the sign and until they do the 10 minute limit will continue to be enforced. ParkWise recommends changes in downtown parking and the City Council can approve those recommendations and make changes by resolution. ParkWise is currently considering several changes in downtown parking, including the 10-minute spot by the former Wells Fargo ATM. The City has not yet received the recommendations.